Edited by amateursarto, 13 December 2010 - 01:10 PM. Here's the pic of the draft. It'a a bit hard to see since I let photobucket auto edit the pic. Anyway, what do you think? What problems do you all see? I haven't drafted the sleeve or the trouser, but I will in the next week or so. BTW, This coat is not going to be canvassed since I want to wear it in about a month and a half, and I won't have the time to put into it to make it a canvassed coat. I know I won't be able to get the belly of the coat in the pic I posted above I just want to copy the style of the coat. The cloth I'm using isn't like what Dugdale sells, but I am fond of it anyway. So even with the coat being fused (can I say that here? , smiles), I'm not doing great cloth, (though its nice enough), and i'm not using canvas. I'm confident I can make it up, (since I've made about 6 suits for my son and SG has given me some insight regarding fused coats. Really, I consider this project just that, a project that I will be able to wear. Any help from the pros here is appreciated, though I know and understand your preferences. Actually I prefer canvassed coats too; I just want to get my feet wet on a suit for myself after putting it off for awhile now.. I will post as I can in the thread I started about the donlon wedge. This draft includes seam allowances, so you have to subtract those and any darts in the breastline when you measure across the chest. If memory serves, I believe this draft has 4.5" of ease. If you're going to make this coat fused, you'll need to open a small dart in the front armhole - about midway up the height all the way across to the lapel edge. I think I added 1/4" of length, here. Also: scoop out the upper part of that front scye a bit on the draft. You'll have to tape the lower part of the scye - take out 1/8" between the FP and middle underarm; and, 5/8" between mid underarm and halfway up the back shoulder. Because of opening the dart, the bridle needs to be pulled a little firmer when laying it in - take up about 1/2" along the roll line instead of 3/8". This can still be done with a fusible bridle tape; but, it requires a little more work with the iron. PS: I loathe skimpy facings and hems on premium garments. I'd recommend 1 3/4" or 2" for the hem facing. I've been a little show off, without any calculations. Just close to your lines. Blue color --- with almost no distortion of your project, red --- closer to my vision. But in any case suggest more ready to look at drawings in the books, to feel the line. Ah, yes, the backwardly displaced head of sidebody. It appears in the Rundschau system from around the 1970s, and is often referred to as a ironwork free sidebody. I'm not a fan of the displaced sidebody because it weakens the grain and the waist has a tendency to buckle. 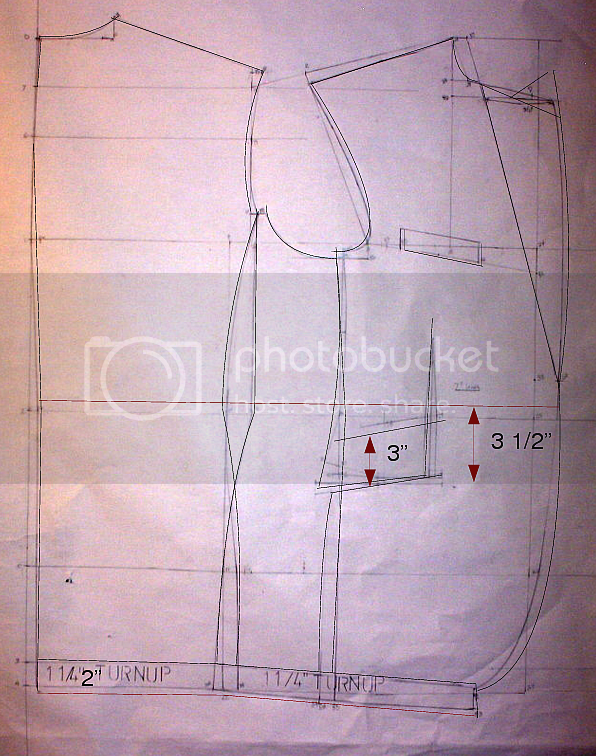 Deviation of the side body used in the armhole, the width of which more than half the circumference of a quarter of the breast. Excess tissue in the underarm area is transformed into soft folds at the back. Edited by jukes, 15 December 2010 - 02:13 AM. How do I measure the ease of this draft while still on paper, or is that even possible? Also, how do I modify the gorge so that it has a fish mouth collar and not a notched lapel collar? A little trick you could try. 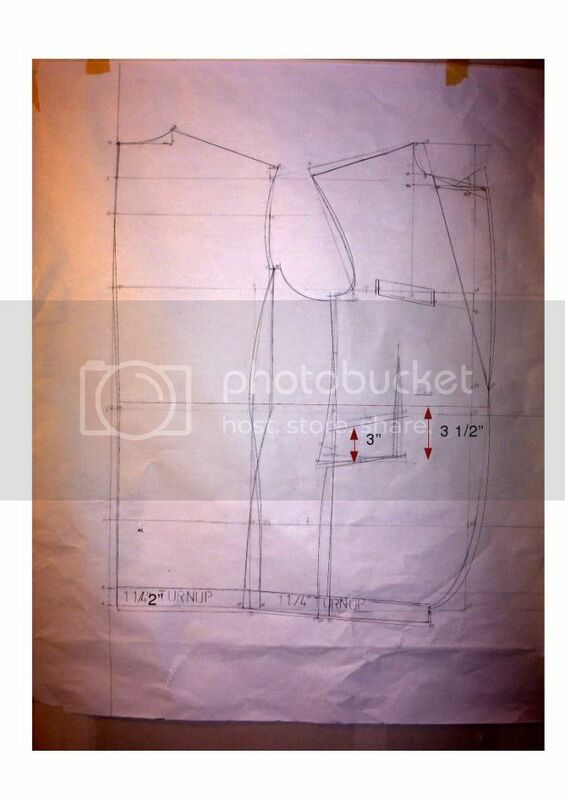 when drafting your pattern, fold the pattern paper under at the lapel crease line, now draw the shape of the lapel and collar section on the forepart of the coat front. when you are happy with the shape, use a tracing wheel to transfer the outline through to the underside of the pattern, When you fold the pattern paper back you will have the required shape, plus the begining of your collar. 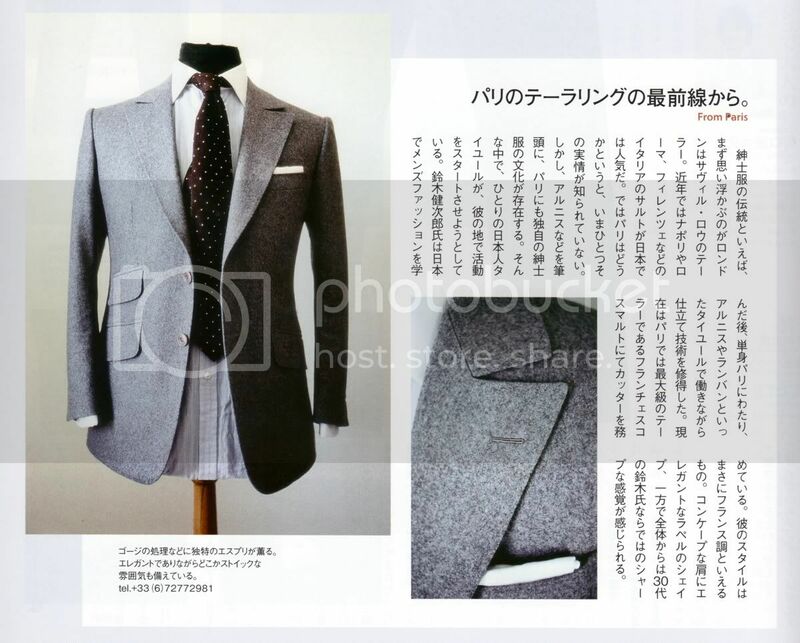 don't forget to add your seam allowance to the lapel. I am putting together what I am calling the Sinclair Modifications to this pattern. Anthony Sinclair was the tailor for Sean Connery for his James Bond roles in the 1960s and who referred to his style as Conduit Cut. I have culled some of these changes from what I have reconstructed from a putative Sinclair-Conduit Cut lounge coat cutting system. I have taken these changes from his system for cutting an overcoat. How Anthony Sinclair really drafted lounges, who knows (I suspect he may not have dropped the front depth of armscye by 5/8"), but irrespective of this I like these modifications and that is the main reason for suggesting them. 1. Move top of centre back in from 0-7 by 1/4"
2. Change formula for back neck from 7-8 to 1/6th working scale + 5/8"
3. To find the back neck point extend up 8-9 1 1/4"
7. Drop down 5/8" below the back depth of scye line to find the front base of armscye. This makes the formula for the front depth of scye = back depth of scye + 1/4". This is still quite a short front balance. This concludes the Sinclair Modifications. Draw a front of scye line vertically up from the chest line. Make sure it just touches the front of the armscye. Control the neckpoint so that it is located 1/5 chest scale + 3/8" from the front of scye line, measuring along the chest construction line. This helps to eliminate the rather messy loss of control of the neckpoint from the ad lib scooping out of the front of scye that Chaudhry introduced to the T&C system. 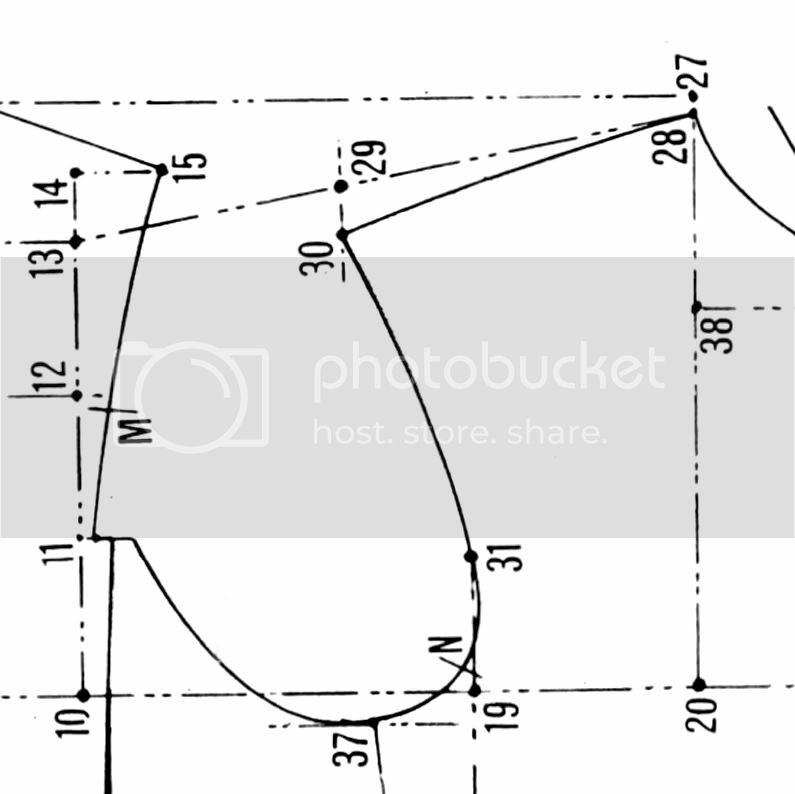 He also fails to adjust his formula for finding the neckpoint for 3/8" seam allowances. These two elements result in a degree of crookedness that resembles a 1930s draft. The above correct helps to eliminate this factor. Push the extra length you form around across towards the shoulder, stretching the shoulder gently as you do this, forcing the excess length formed to the shoulder point. Finally, work the excess length to its final resting point at the the front of armscye. This will also help stripes to run straighter at the shoulder. 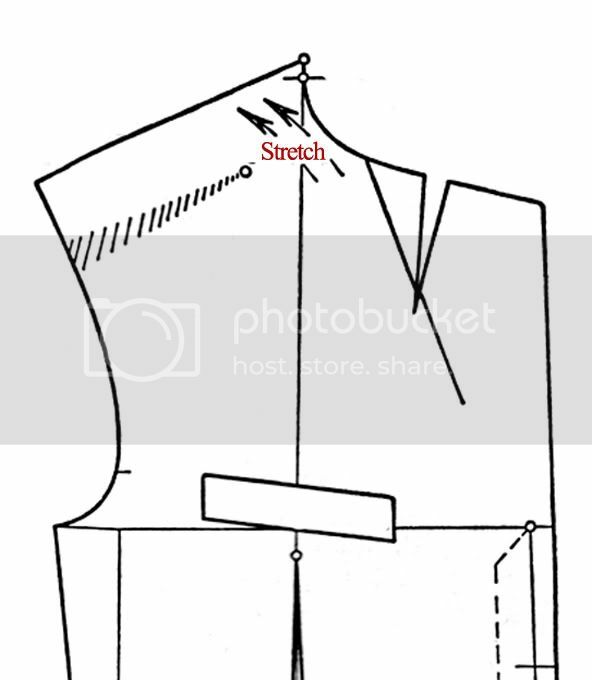 This will stop the side body and front panel from overlapping. Make cuts in the chest as shown. The amount the front dart should open at the pocket level is between 5/8" to 1" maximum - 5/8" will be enough for many figures. To achieve this, open up the cuts in the chest area as shown. In this example, the cuts are opened up 1/8". This crookening dart throws length to the fronts, so to compensate add the same amount, in this case 1/8", to the back balance. I have drafted many a patterns based on the Tailor & Cutter system. When drafting for an individual client I found that the system does not work for a client who has average proportions. The following are the points I think are not addressed by the system, i welcome any advise in this regards. 1) The stance of the client: how do we incorporate a stooped or erect posture into the draft using only measurements taken off the client. 2) The shoulder slope: How do we take into account straight or droopy shoulder. 3) The imbalance in the neck size compared to the chest: Most of the drafts including the above derives the neckline width on the back from the scale (which is based on the chest size). 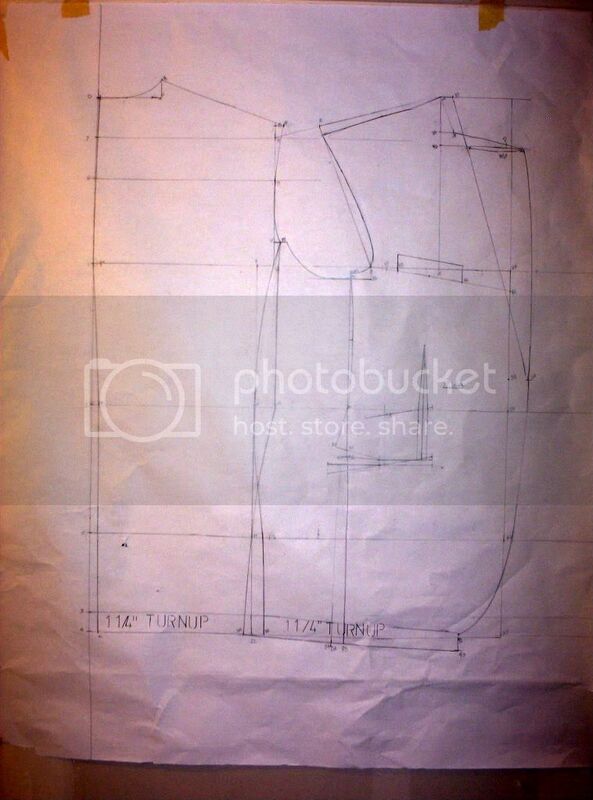 How do we incorporate this into our draft if say a client has 15.5" neck & a 42" chest or a 18" neck & a 42" chest? 4) How do we account for a fuller or weaker chest compared to the average. Same with a fuller or smaller cross back? Jukes, how much ease is in 26 - 21 - 5 alltogether, without all seams? Maybe you still have the draft somewhere, and you can measure it for me, please? Edited by Der Zuschneider, 20 December 2014 - 01:37 AM. 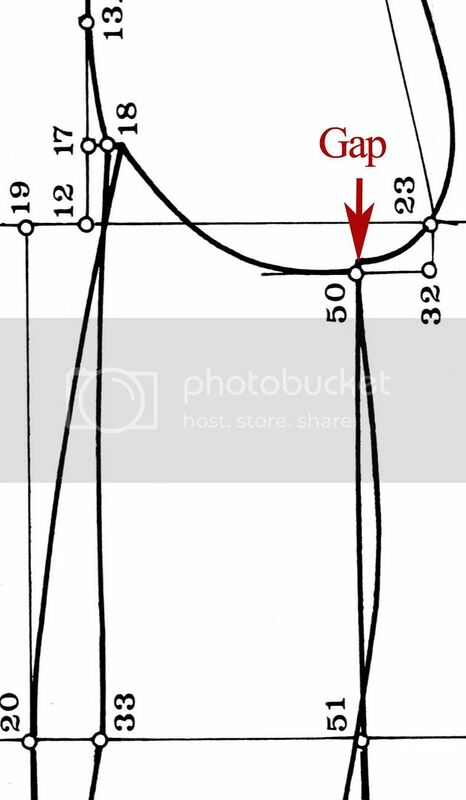 Point 5 to 26 is the same as the chest line, in this case chest = 38 = 1/2 chest plus 3 1/2 = 22 1/2 point 5 to 21 = 8 so the total between 26 & 5 would be 40 1/2" then you add your curves as shown which = 3/4 on each side of the back (total) 1 1/2 so total would be 42" which includes 3/8 seams + the hip curve of the forepart and side body. Edited by jukes, 20 December 2014 - 03:52 AM. 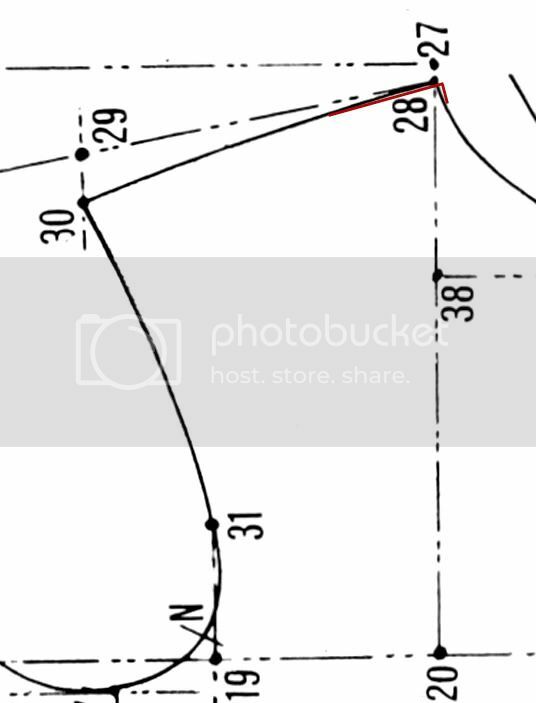 About 5.62cm net ease in the hip circle. Same like Mueller. I thought it would be more. Edited by Der Zuschneider, 20 December 2014 - 05:10 AM. Just had another look. 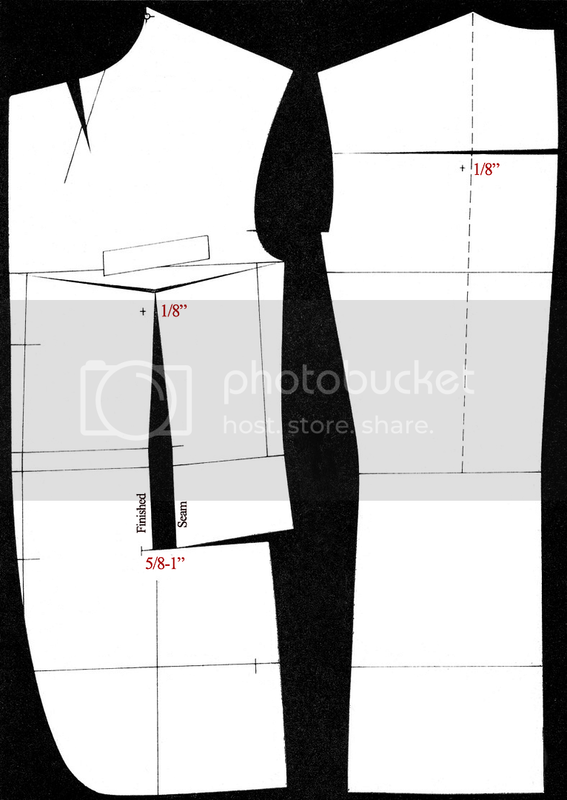 In simple terms X to 24 is half chest plus 3 1/2" = 22 1/2" plus the overlaps of hips side seams and side body = 1 1/4" so total half hip is 23 1/2" including seams. Edited by jukes, 20 December 2014 - 06:15 AM.